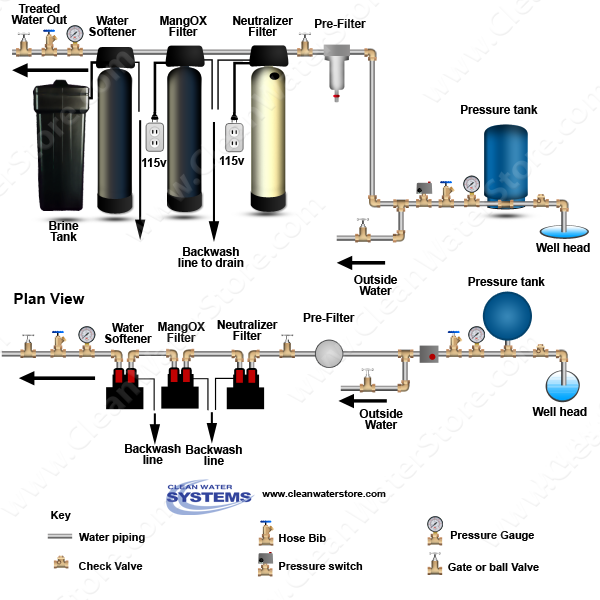 Clean Well Water Report: Should I Install a Neutralizer Before or After an Iron Filter? Should I Install a Neutralizer Before or After an Iron Filter? We are looking at adding a neutralizer to our current water system. We have a private well which feeds a pressure tank. After that we have an iron curtain to remove the iron and then a water softener. Where in this configuration does the neutralizer go? Note that this installation includes a pre-filter before the neutralizer. We recommend a Lakos Twist II Clean sediment filter for its effectiveness and ease of use: the Twist II Clean will remove sand, sediment, and organics from your water, thereby helping to preserve the integrity of your neutralizer and other systems on your line, and cleaning it is as simple as twisting the handle to begin the patented reverse-flushing action, which will backwash your filter from the inside out. If you haven't yet decided on a neutralizer, we recommend a calcite neutralizer 7000-SXT. 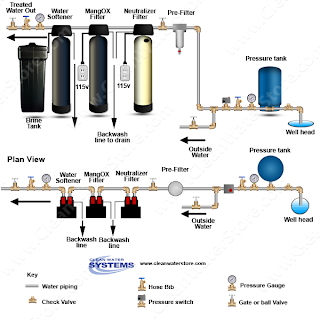 This system will eliminate acidity in the pH range of 6.0 - 6.9 by slowly dissolving calcite (calcium carbonate) into your water as it flows through the filter. It uses a high-quality Enpress tank with a Vortech distributor, which allows the neutralizer media to be backwashed at lower flow rates, saving you money on water and energy. Thanks for the letter, Donald. Once you've selected and installed your neutralizer, let us know how it's working! We love to receive pictures and testimonials at support@cleanwaterstore.com or on Facebook, but you can use these same contact methods for any further questions you may have about water or water treatment. Good luck!